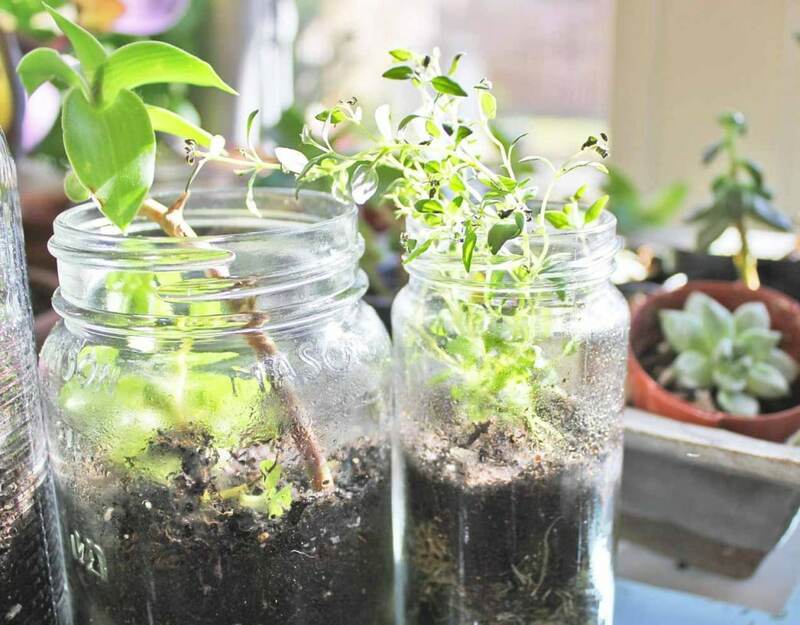 Oooh I am so excited about this week’s Mason Jar Terrarium Tutorial – always fancied a mini garden in a jar? 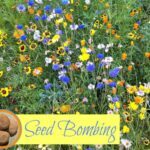 Well now is your “chance” to learn “how to”… It is a guest post from the gorgeous Jamie from Scissors & Steam. 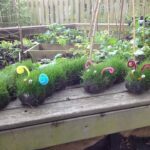 I have been wanting to make Terrarium with the children for a few weeks now. Red Ted is so interested in nature and how things grow, that I thought he would really enjoy one of these indoor mini gardens. Especially, as winter drags on a little longer! So it is wonderful to have Jamie here. 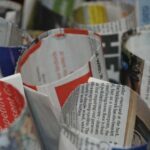 A relatively new blog – Scissors & Steam – well worth a visit – you will find all things wonderful in the world of design. Crafts from crochet to DIY Wine Bottle Glasses (I LOVE THESE! 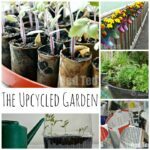 What a fabulous way to recycle!). Right… now to Jamie and the Terrariums! My husband works in a bleak, windowless wasteland of cubicles and fluorescent lights. He got the bright idea to install a terrarium gro-light at his desk, so he can have a little jungle of plants and his very own bubble of non-circulated, forest-fresh oxygen. 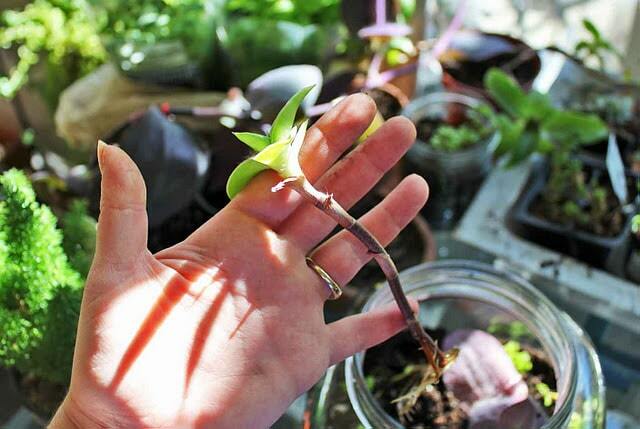 Lately I’ve been pulling up bits of plants and sticking them in mason jars. Sometimes in soil, sometimes just in water. Some take root and some die… Kind of like my thoughts in general, actually. The man was ogling some creeping jenny that was lushly growing in a little jar by the window, so I thought I’d make him a little desktop garden. 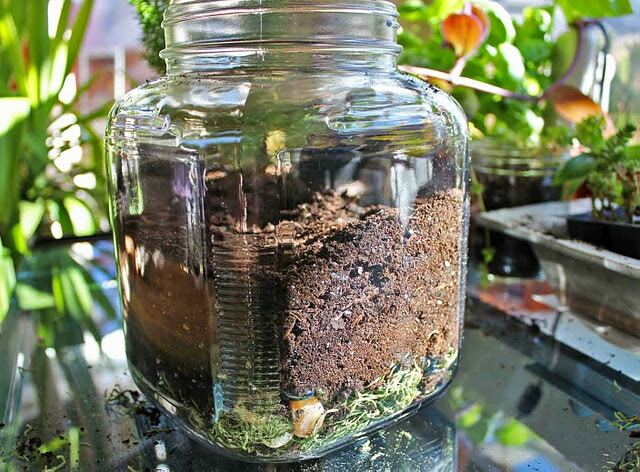 Take a handful of moss and layer it on the bottom of the jar. It should be fairly thick. 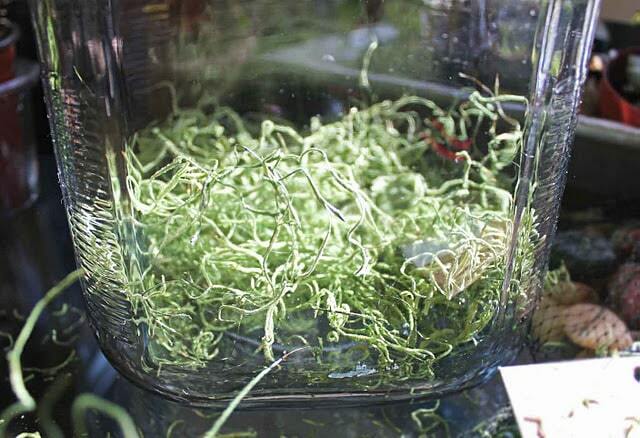 The moss keeps water from just sitting on the bottom of the jar and turning brown and nasty. Next Layer some rocks on top of the moss. 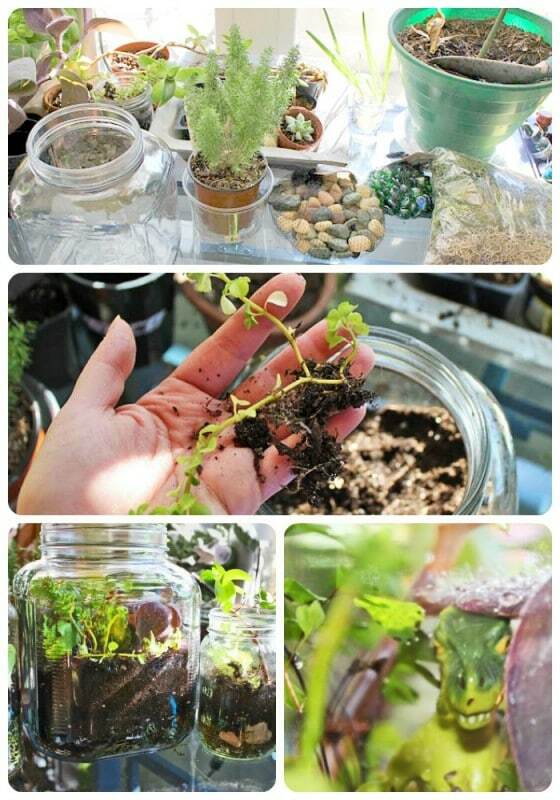 Don’t skip the rocks; since the jars have no drainage, they’re there to drain water so that your plants don’t rot. Looking back I should have made a thicker layer of moss and rocks, so add more than this if you can. Next dump a bunch of dirt on top of the rocks. I used cactus dirt because the plants won’t be watered as much as normal due to the lack of drainage. Next plant your plants. It’s best to use plants like succulents that don’t require a lot of water, but I used some creeping jenny, a bit of spider plant, a maidenhair fern, and a cool fuzzy purple plant whose name I can’t recall. 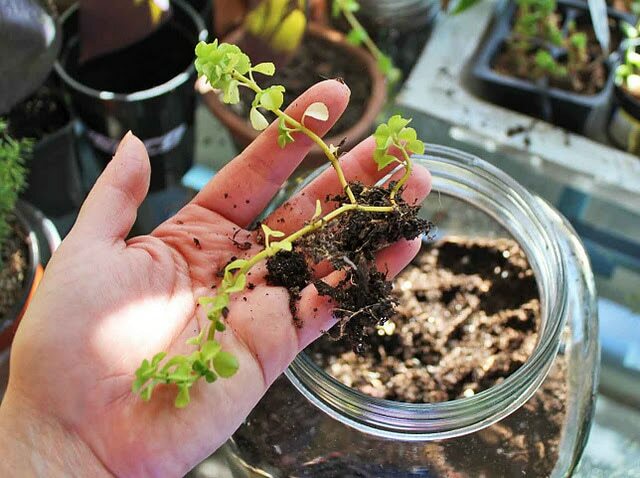 Just poke your finger down in the dirt and stick the plants in. RAAAWWWWRRRR. 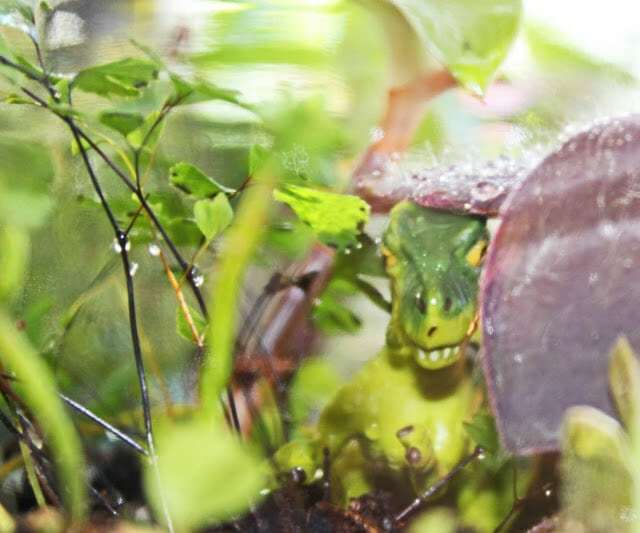 Seriously, what guy wouldn’t dig a T-Rex hiding out in the foliage? No guy. 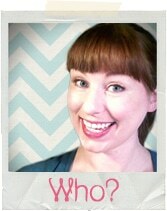 That’s who. The other three terrariums I threw together at the same time. 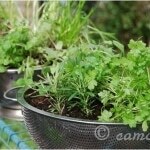 These are so easy to make, and even easier to maintain.Don’t overwater!!! Just spray them down with a mister, or sprinkle in some water when the dirt starts to get dry. Stick your finger in the dirt, and if you feel wet, don’t water it yet. Unless the plants look sad. If they look like they need a hug and a pep-talk, give them a little. The water has nowhere to go, so give the plants just enough to survive. Deprive them for their own good. Keep them trimmed back, too. 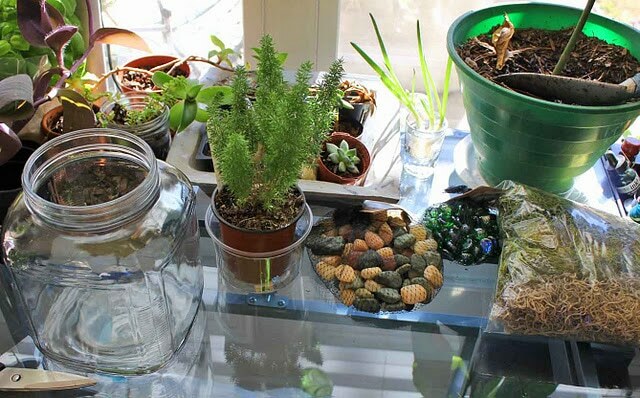 If you make an enclosed bio-sphere environment (i.e., you put the lid on the jars) just open them up once a month or so and give them a misting. The humidity in the jar will be fine for their moisture, as long as you don’t open it up too often. Thank you thank you thank you Jamie for this GORGEOUS guest post! 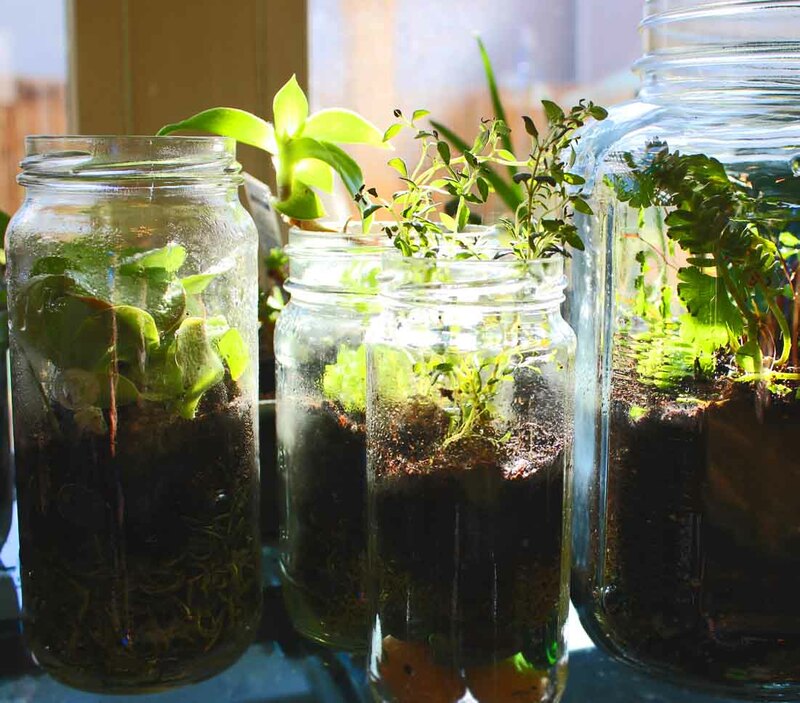 So lovely to have you share your Terrarium How To with us. If you enjoyed this, why not reward Jamie with a visit and a nosey? Scissors & Steam. 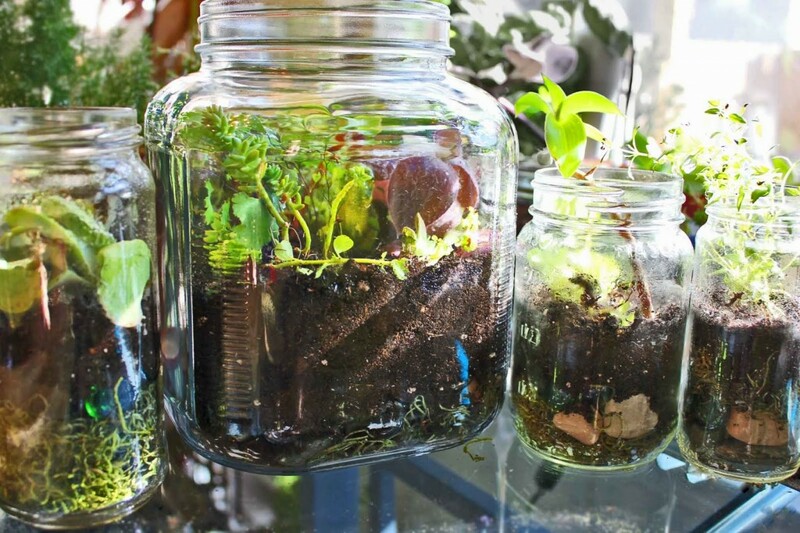 Great idea, and a great use for old jars, I\’ve done something similar using old lightbulbs to make mini terrariums, although they can only really hold one type of plant. In a light bulb – wow!!! I would love to see that!!! How lovely. Love the T-Rex in there too! What a lovely idea. Any tips for keeping house plants alive, I\’m so rubbish with them. @ Liz – I have seen whole little landscapes in jars – with little people and boats. So cute! @rebecca – if only it were that easy… to answer in one swoop – all plants will vary – need more or less light/ more or less water etc? Am guessing common reasons for plants not doing well is over or under watering them? That is such a cute idea. I love the dinosaurs hidden in it! A very good question Isil – I would buy it online (e.g. 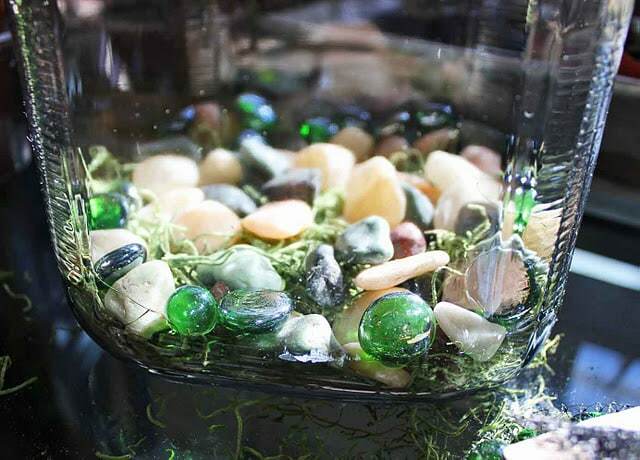 http://www.netpetshop.co.uk/p-27684-zoo-med-reptile-terrarium-moss-substrate.aspx?CAWELAID=525519541) it looks like pet stores supply it. Would ask at your local garden centre too! Lovely tutorial! Have been wanting to make one with putti for ages.. I have always wanted to to this and these are great instructions! To answer Isil\’s question… I got the moss at Michael\’s (I believe). 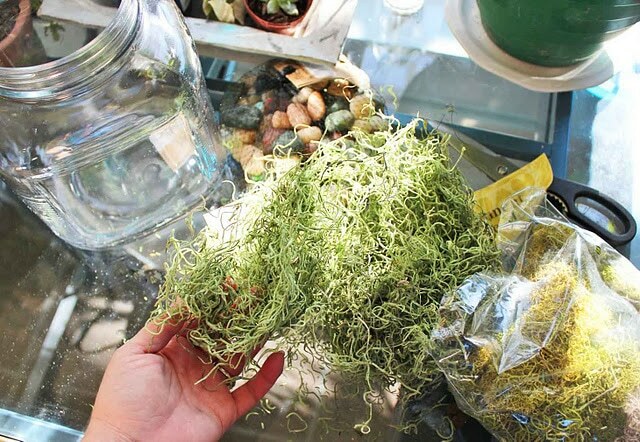 You can buy packages of moss at a lot of craft stores, usually in the fake flower section. If you gather it wild, you run the risk of bringing home tiny little buggers like mites and chiggers. Not something you want in your terrarium! What a great idea! Maybe one for Science sparks! 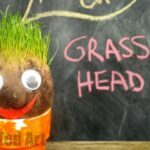 I thought you may like it on Science Sparks.. right up your street! 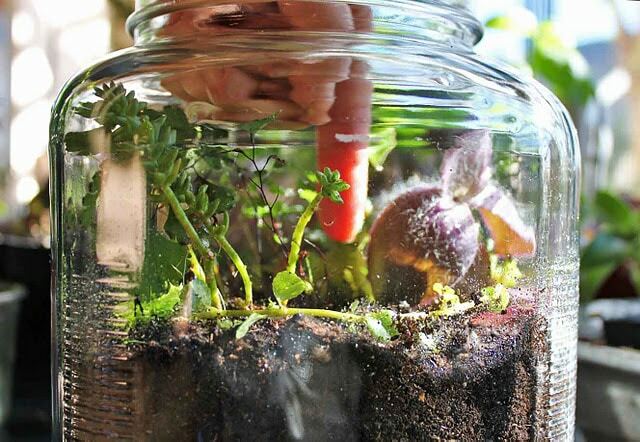 A terrarium has been on my “I want to make” list for a very long time! Now this makes me want to get going on it! These are great! Thanks for the detailed tutorial! 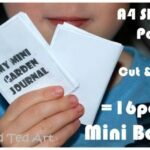 Thank you so much for this, my husband also works in a cubical & is in need of something ‘Lively” making a few right now 🙂 so easy. Also collected rocks from the beach & the moss from the trees… so just had to buy the cactus soil & plants.. super cheap & THOUGHTFUL gift. I just made this with my daughter and it was so fun. I will make this again for my friends desk. 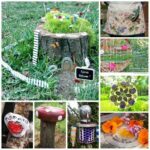 Love it, I’ll make it for my kitchen windowsill, and for gifts super idea thank you! 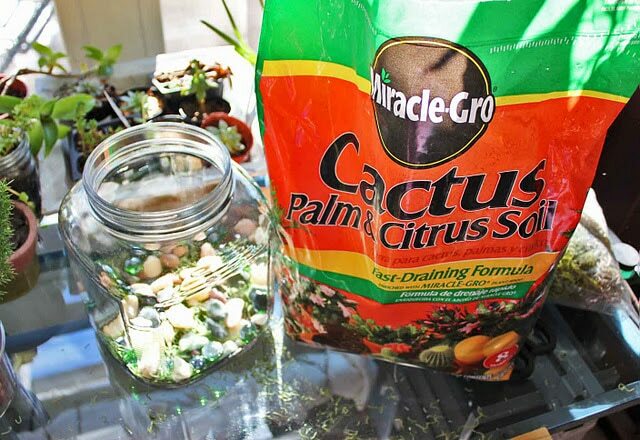 I just took a terrarium class from a master gardener, and she said to add 1 spoonful of activated carbon (can purchase at any fish tank supply store) between the rocks and the dirt. Just sprinkle it over the gravel/ rocks. It keeps the water and clean. They are so cute and fun!